Soudbinine met Rodin during a stay in Paris, and in 1904 decided to leave Russia to settle in France. As soon as he produced it, Apocalypse was exhibited at the Salon d’Automne of 1921. 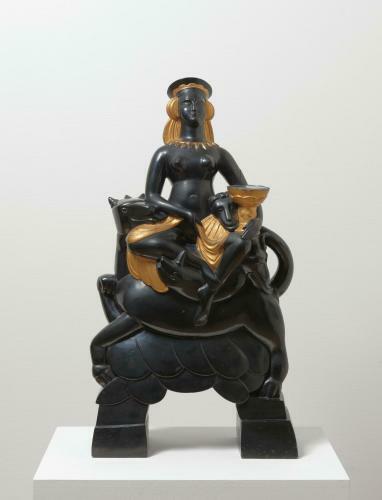 Faithful to the iconography of the Biblical text, it shows the Whore of Babylon “sitting on a scarlet beast” with “seven heads and ten horns”, one hand holding “a cup filled with her abominations”, while the other lifts up her dress.